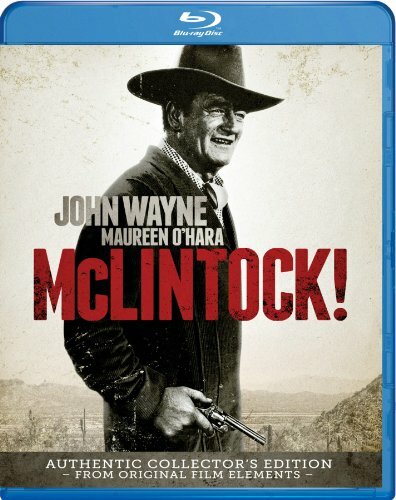 HOLLYWOOD, Calif. - Legendary actor John Wayne demonstrates his comedic side in the uproarious Western classic McLintock! on Blu-ray May 20, 2014 from Paramount Home Media Distribution. Scanned in 4K for the first time, this official Batjac release presents "The Duke" at his two-fisted best with the beautiful, fiery Maureen O'Hara as the proverbial thorn in his side. The McLintock! Blu-ray also includes commentaries by Leonard Maltin, Frank Thompson, Maureen O'Hara, Stefanie Powers, Michael Pate, Michael Wayne and Andrew McLaglen, an introduction by Leonard Maltin, The Making of McLintock!, plus featurettes, a photo gallery and the theatrical trailer. John Wayne stars as George Washington McLintock, a proud, defiant cattle baron whose daughter is due home from college. But G.W. 's happy reunion is tempered by the arrival of his headstrong wife (O'Hara), who recently left him. Verbal fireworks explode, slapstick pratfalls bloom...and the Wayne-O'Hara "reconciliation" culminates with the notorious "spanking" scene and the biggest mudhole brawl this side of the Mississippi in this wild, raucous and hilarious Western comedy! * The Making of McLintock! * The Corset: Don't Leave Home Without One!